Vacation rental house. 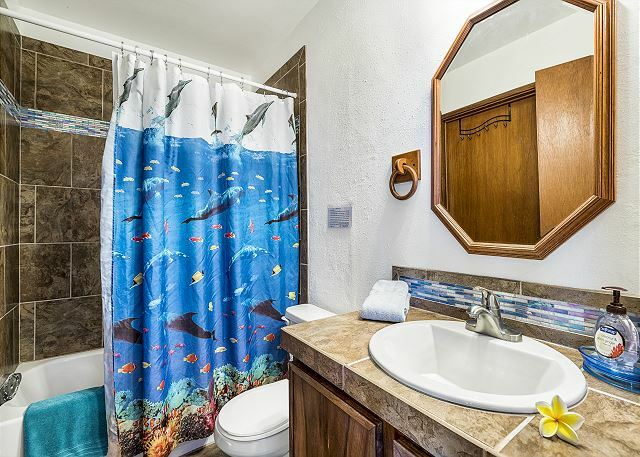 Sleeps 18, 4 bedrooms, 3 bathrooms. No pets allowed. 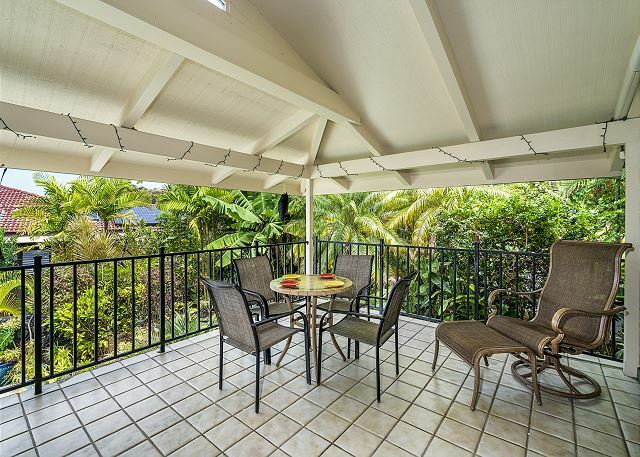 Gorgeous Kona sunsets can be enjoyed from the upper covered lanai. 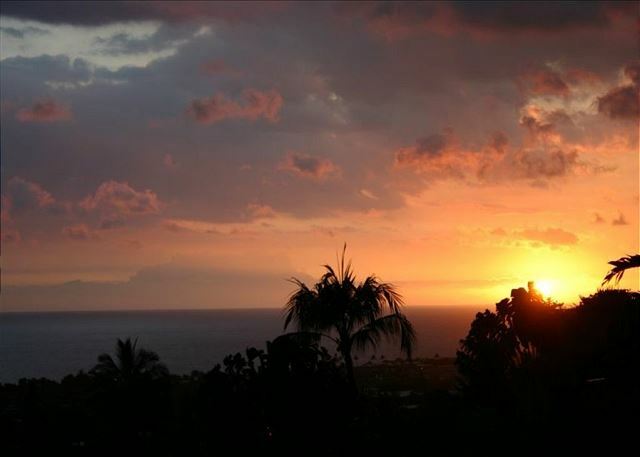 Nearby snorkeling at Kahaluu beach park or make a short trip down to the famous Kealakekua Bay! 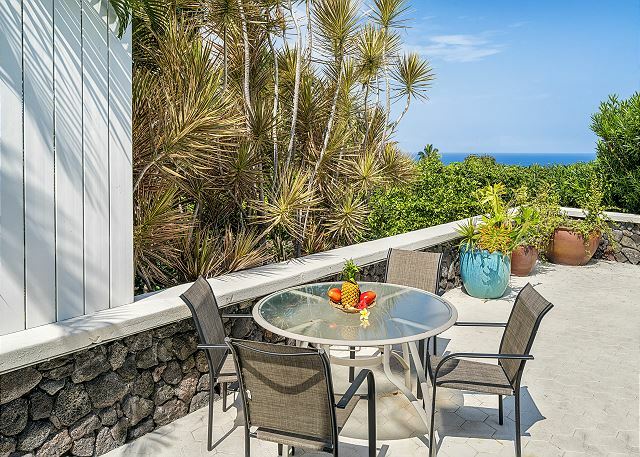 Swim or snorkel with the dolphins found off the coast of the Big Island. 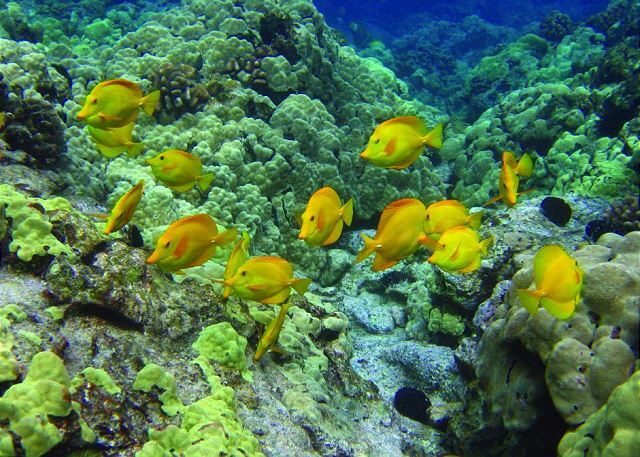 A popular spot to see them is the snorkeling area "Two Step" located next to Puuhonua o Honaunau National Historical Park. 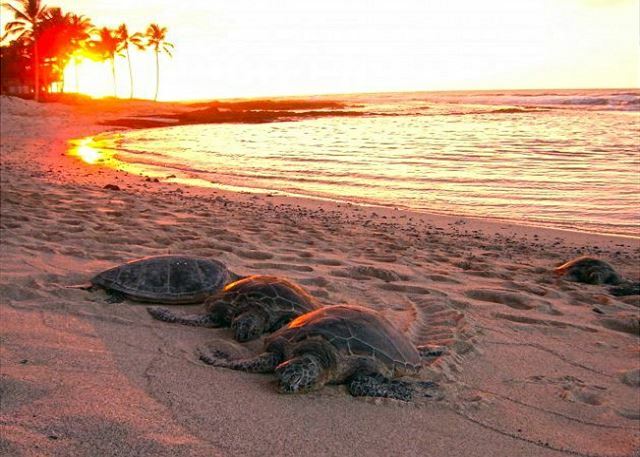 Honus (Turtles) can be found resting on Hawaiis beaches. Admire but please do not touch. Make a trip to the east side of the island to see the active lava flow! 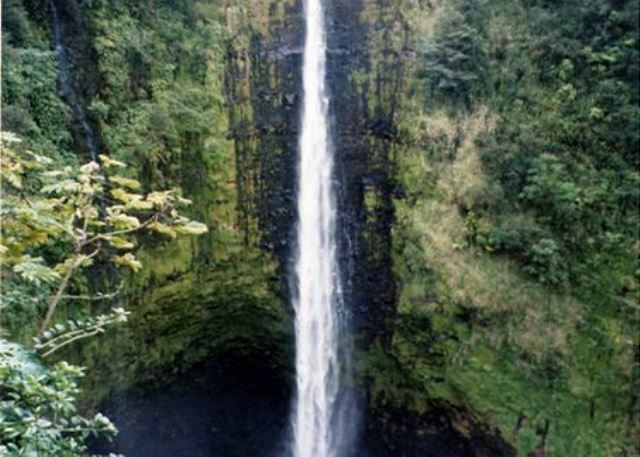 Make a trip to the east side of the island to see the famous Akaka Falls! 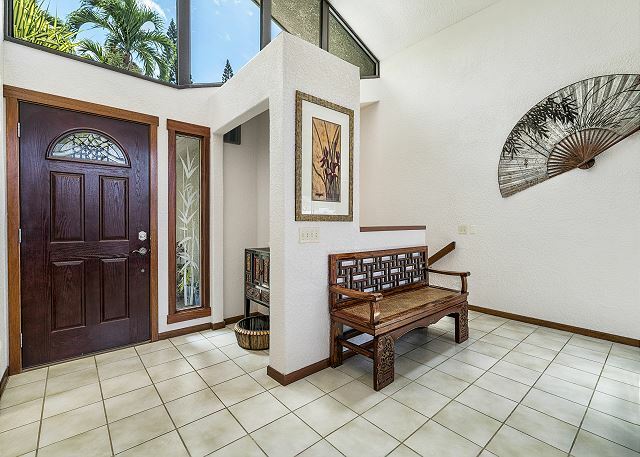 This 2700+ square ft. house is perfect for entertaining family and friends! 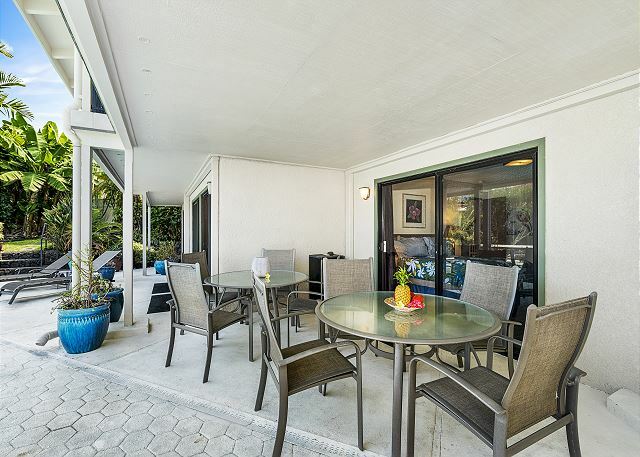 With so much space you can accommodate everyone's needs; whether that be barbecuing down by the pool with friends or finding a quiet, private spot to relax with a favorite book. 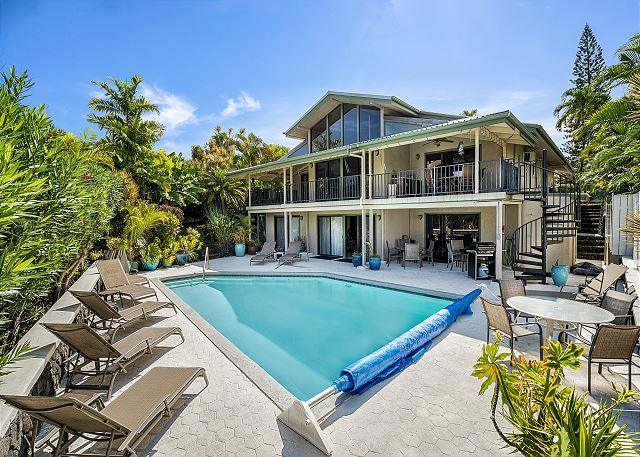 This home offers the ultimate experience in vacation living! 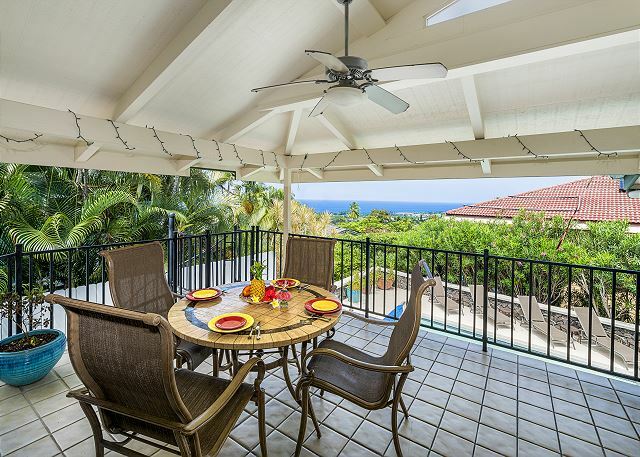 You can enjoy ocean views while relaxing on the lanai or by the 7' deep salt water pool. 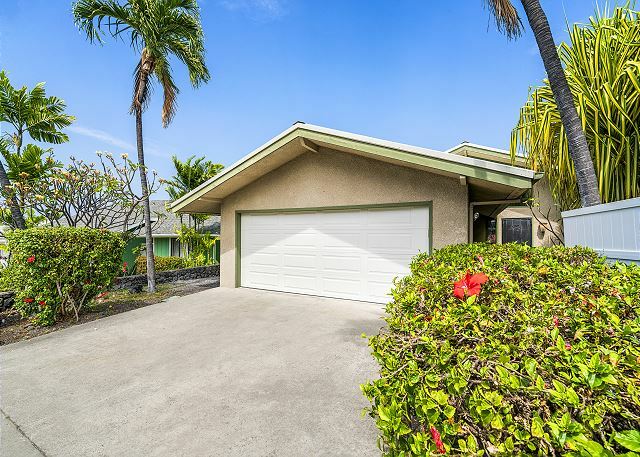 The house has an amazing location; it's just a 10 minute or less drive to the well known Magic Sands beach, the famous snorkeling spot Kahaluu beach, or the popular Coconut Grove market place in the heart of Kona. 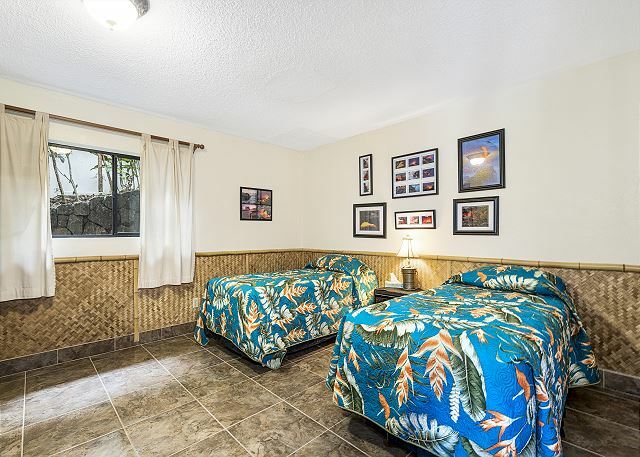 There are numerous air conditioning wall units in the house and all bedrooms allowing everyone to be comfortable and to cool off from the Hawaii sun . 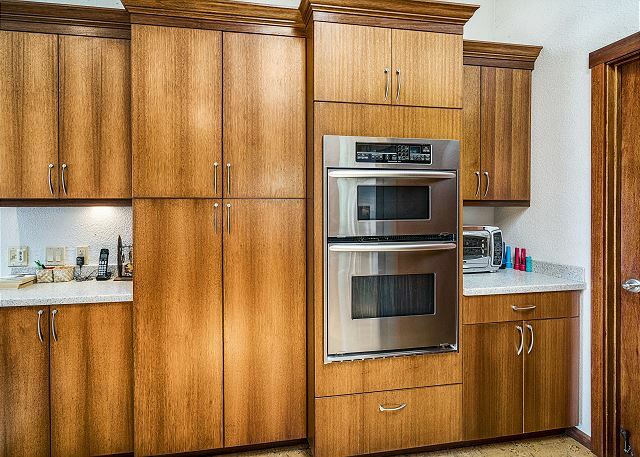 The upstairs portion of the house has a fully stocked kitchen with a gas cook top stove, oven, dishwasher, and everything you need to prepare a delicious meal. Off of the kitchen is a dining area that seats 8 along with 4 chairs along the kitchen bar. 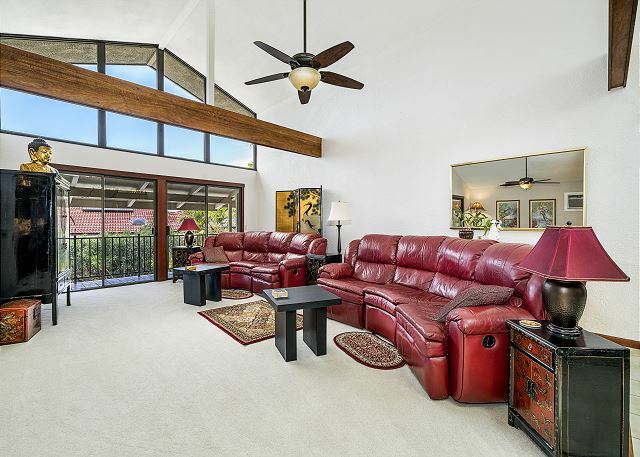 You can find the formal living room upstairs along with the master suite. 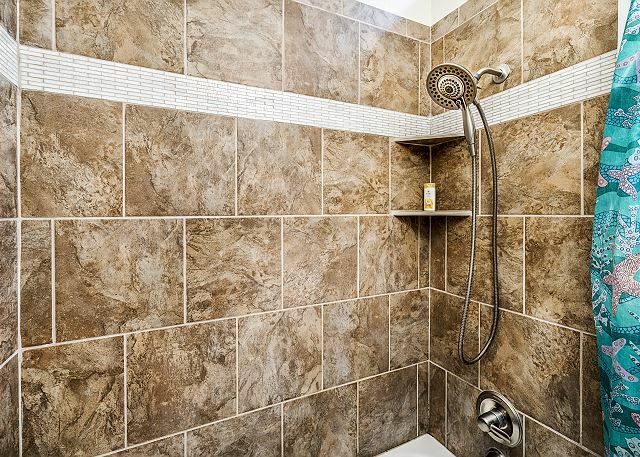 The master suite has it's own bathroom that can be opened up to the living room area via an added door or can be locked off for privacy. 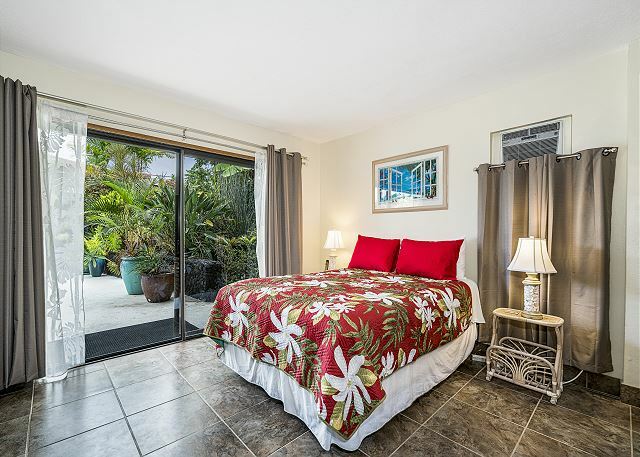 You can also enjoy your own private entrance to the lanai from the master suite. 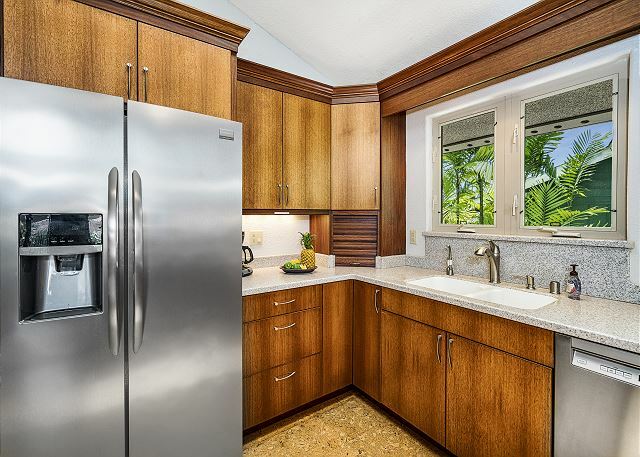 The spacious lanai is perfect for enjoying the sunset and relaxing; there is a dining & serving area including a sub-zero wine refrigerator! 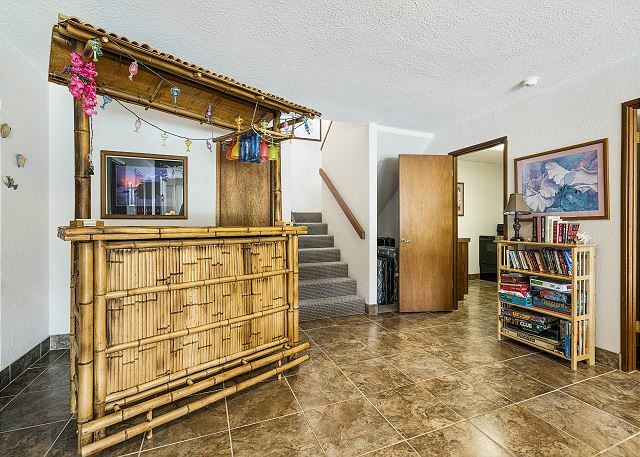 The downstairs portion of the house has an entertainment room with island-style furnishings, Tiki bar, as well as two sleeper sofas for added versatility when accommodating guests. There is also a kitchen downstairs making it easy to prepare large meals. 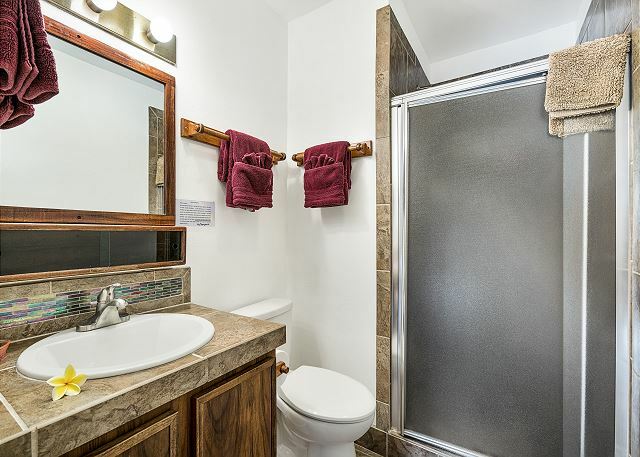 You will find the other three bedrooms and two bathrooms downstairs. 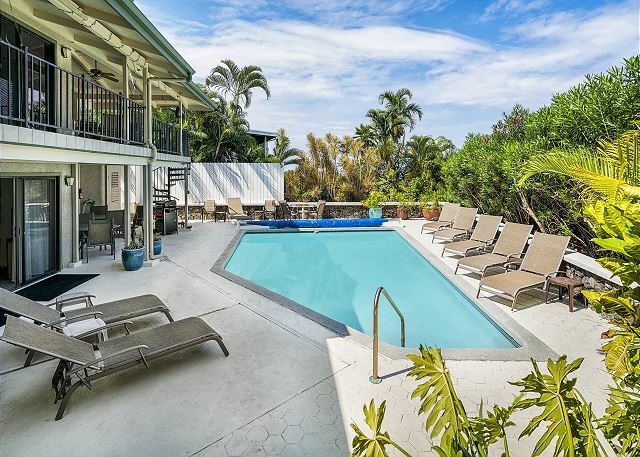 The private pool area has an outdoor dining area, lounge chairs, gas BBQ grill, and an outdoor shower to rinse off after beach adventures. You can spend your days cooling off in the pool and your evenings floating under the stars. 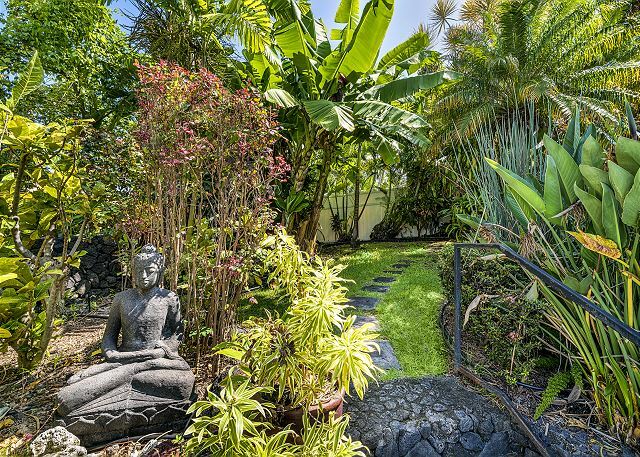 Make this property your family's future personal resort for many years to come! Bed configuration is below. House sleeps 18 people total. 1 Queen sized air bed. This airbed can be placed in any room per the guests request. 5 Sleeping futons available that sleep 1 person each by request. These futons can be placed in any room per the guests request. Any groups exceeding 12 guests must inquire with property management for approval. We had a wonderful time relaxing and enjoying Kona! The house was perfect for our family vacation with adult kids and grandkids. The pool and surroundings was amazing. Kitchen well stocked and there was even beach mats and various items. One item of note - there is baby items available at the house (portable crib, high chair etc) even though it is not in the listing. 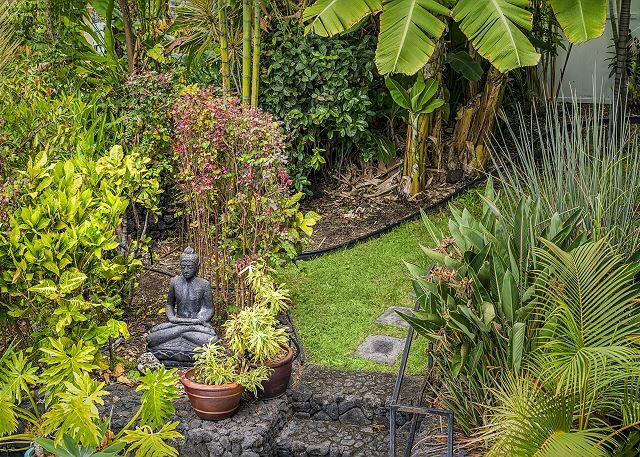 Mahalo for the kind review, Krysti. 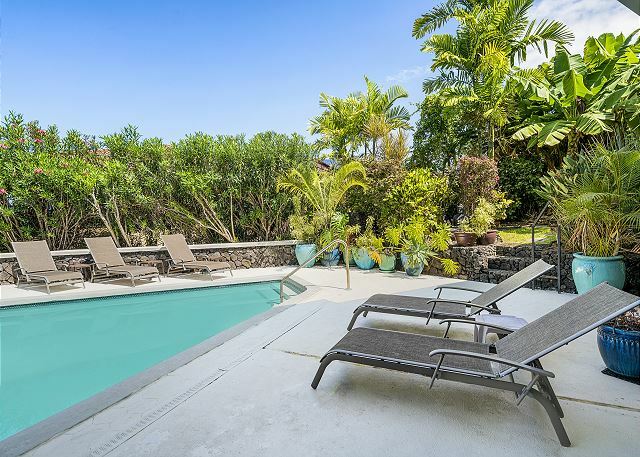 We're so happy to hear that your family was able to have a truly special time in Kona staying at Mahuahua Hale. We hope to see you again soon! Best vacation home we could ever ask for! The house was beautiful, spacious, and clean! The swimming pool was the highlight of our stay. Lasting memories! And the location! So Convenient! 50th anniversary with kids & grandkids. 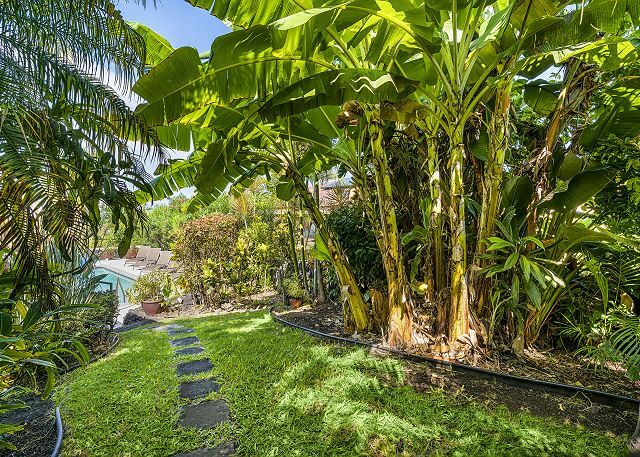 Great house, pool, grounds, location. Sliders need work. Need to emphasize hot solar water vs. cloudy days and highlight available electric water heater those days. This house exceeded our expectations, was in a great location, and made our holiday just that much better! The pool is great, nice and warm and a decent size to laze by it swim some lengths. The house itself is spacious with every amenity you can think of. Everything you need for a day at the beach is provided as well, which is definitely a bonus for holiday makers. 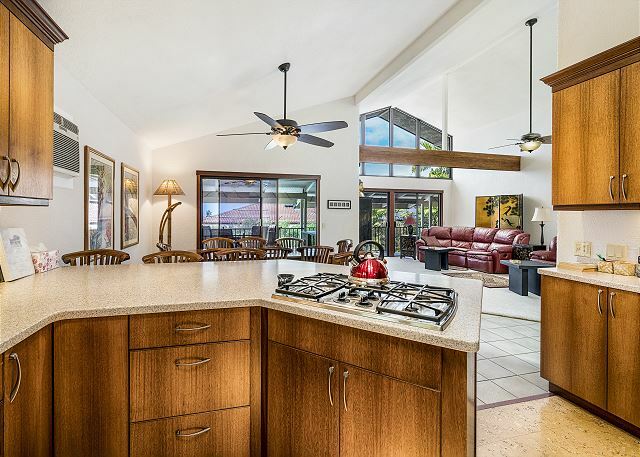 It also comes with the added bonus of a downstairs kitchen (to add to the massive kitchen upstairs), so you can prepare food down by the pool if you want. Brilliant holiday location!